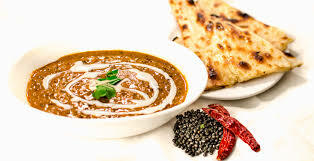 Dal makhani is a very famous dish. This recipe is made with whole urad (black lentil), kidney beans with spice. Put enough water to cover the lentils. start Cooking with high flame after one whistle you can change it to medium flame and let it cook for another 15-20 minutes or until the grains cook completely. After that, open the cooker and mash the grain roughly not too much. Take a heavy bottom pan roast kassoori methi in it. keep it aside. Put ghee (if you do not want use ghee, you can use oil) add cumin seed, asafetida sauté well put small chopped onion, ginger & garlic pastes fry it till onion starts to change color to pink then put other spices and tomatoes mix it well and cook for 2-3 minutes, add lentils mixture. If you feel your dal is thick then you can add water as much as required then cook 5-10 minutes on low flame. After that close it and for serving you put butter, a little cream, crush the roasted dry fenugreek leaves. Serve with roti or naan.